"A look back at the march of science doesn’t show an even line of progress led by smooth-talking popularizers who are never wrong." or focus of interest, but sometimes I see them, and when I do, it seems that most often they are on a blog called Sultan Knish. A recent post on that site is called "Science Is For Stupid People" and its very well done. There's been a lot of analysis of science and psuedo science and pop science around the internet lately. Basically people are getting tired of science being used as a bludgeon or a political weapon rather than a method of inquiry. The easy way to tell real religion from fake religion is that real religion doesn’t make you feel good. It doesn’t assure you that everything you’re doing is right and that you ought to keep on doing it. The same holds true for science. Real science doesn’t make you feel smart. Fake science does. No matter how smart you think you are, real science will make you feel stupid far more often than it will make you feel smart. Real science not only tells us how much more we don’t know than we know, a state of affairs that will continue for all of human history, but it tells us how fragile the knowledge that we have gained is, how prone we are to making childish mistakes and allowing our biases to think for us. 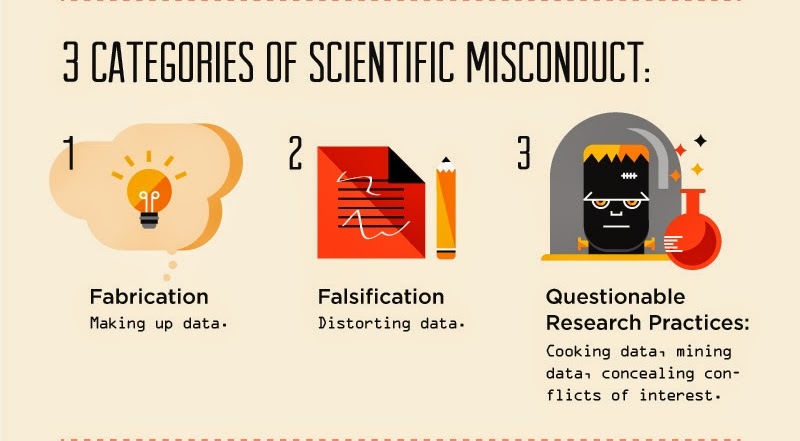 Science is a rigorous way of making fewer mistakes. It’s not very useful to people who already know everything. Science is for stupid people who know how much they don’t know. Science, properly used, is merely a system of study using measurement and technique to ask and answer questions. There is no such thing as a bad skeptic in science; it is made up of skeptics, questioners, and those who wonder if what is commonly accepted is true. Anyone who refuses to admit or even believe that they could be wrong is not doing good science. What was once absolutely certain has later proved questionable or even false many times in scientific endeavors. And when that happens, there's always a group of people who will at no cost admit they were wrong. Those people are not good scientists. Its a sad truth that it takes a generation for new ideas to take hold in scientific communities, because the old guard that will not give up what they believe or want to be true have to die out in order for the new to take hold. For example, it was known to be fact that the human body was made up of various "humors" in the blood which would control health and mood. Bleeding was a useful way to balance out those humors, by removing the bad humors that had built up. Literally, cutting and letting some blood out. Medicine was not about correcting chemistry or dealing with invasive bacteria or virii, it was about correcting these imbalances, often by causing diarrhea in the victim/patient. Get it out of your system. When scientists such as Pasteur found the existence of bacteria and proved it, the reaction was strong and angry. Pasteur was thrown in an insane asylum for a time. Think about it from the perspective of the time. Every scientist on earth claims the humor theory, which has seemed to work and be valid. Along comes this crackpot that claims they're all wrong and its in fact itty bitty creatures that invade the body. Microscopic, impossible to see without special equipment. He sounds insane from that perspective, doesn't he? Except he was right and he could prove it through experimentation. But the old guard knew their system, had reputations based on it, careers and esteem based around the old system, and even books sold about it. Pasteur's proof was meaningless, it was in the way. It took a long time to get that old system pushed away finally. If tomorrow, someone absolutely, objectively proved evolution was the idiotic pile of nonsense it is, it would take decades for science to change, and even longer for culture to catch up. A generation, even. Because too many people have too much at stake and it is so ingrained in our culture and entertainment people just cannot give it up easily. And since culturally, questioning some scientific proclamations is essentially religious heresy, a sign not of being confused but pernicious, destructive, and a knuckle-dragging sister-marrying neanderthal who'd vote for Sarah Palin, this would be an even tougher uphill battle. No matter what the truth was, what was proven, or how clear it was. And this is the problem so often with science. Its done by humans. You aren't transformed into a higher being by getting that degree. Putting on a lab coat doesn't make you any less selfish, corruptible, greedy, or biased than anyone else. Scientists are no better or worse than anyone else, its just a job. Being a scientist doesn't make you a smarter or truer person. It just makes you a guy with that career. But for some, needing an objective, absolute thing to trust in but rejecting religion, science becomes their faith. It doesn't matter exactly what science says, as long as its Science. A scientist said it, and I don't know any better so it must be true. Someone disagrees or questions that, and thus, they are wrong, bad, stupid... heretical. This lack of understanding but certainty combines into a hideous sort of quasi-science Greenfield calls "Tysonism" for the popularity of Neil Degrasse Tyson, current spokesperson for pop science. By Pop Science, I mean the popular understanding of and publicized things people take for science, such as "humans are causing catastrophic planetary climactic change." Tysonism is why ObamaCare suffered a disastrous launch, why the VA reorganization didn’t work and why we’re back in Iraq. Technocrats don’t make mistakes. They can’t. They’re only at the top because they’re smart. If they ever admitted to being stupid, they would lose their right to rule. Like Lysenkoism, Tysonism uses ideology to determine the outcomes of science. That’s how we keep ending up with Global Warming as settled science no matter how often the actual science contradicts it. 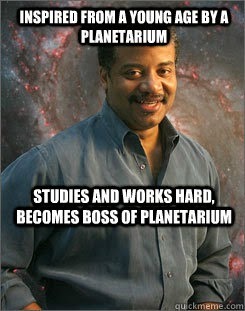 Tysonism appropriates science without understanding it. Its science consists of factoids, some right and some wrong, which simplify and clarify everything. Its manufactured intelligence makes people feel smart without actually giving them the critical tools to question the false assumptions of a Tyson. Pop Science isn't about the facts or evidence, its about who holds these positions and what they mean politically and culturally. Few people who "F***in Love Science" as the crude Facebook page cries don't know much about science at all. They love Geek Culture not out of any particular allegiance to comic books and fantasy but because Harry Potter films are so fun and Big Bang Theory makes them laugh. People love Neil Degrasse Tyson's version of science because he promotes a certain aggressive atheism and contempt for the correct targets (such as George Bush) that fits their worldview. He confirms their assumptions by giving them a veneer of scientific support. Like the first episode of Cosmos which portrayed history as some kind of battle between science and stupid Christians, Pop Science is a method to wrap a warm and comforting blanket of virtue around what people already figured to be true. There is no need to think about anything because the smart people have already done all the thinking. You can show you are smart by accepting their conclusions or show your stupidity by questioning them. Science and skepticism are the tools of stupid people. As Socrates put it, I know that I know nothing. We have the most to fear from the smart people who don’t know and will never admit how little they know. The truth is, science doesn't support or deny any political party or ideology. Its just science. Often it is mistaken, but corrective. Some positions on the left are scientific, others are not. The same is for the right. Christians hold to and reject other scientific positions, as do atheists. Science has no more to do with politics than sculpture or literature. But for some, Pop Science is their religion and politics, their culture and their art. It encaspulates everthing by being only what they wish to be true. And the thing that suffers most from this is good, well-done science.